Welcome to the pages for the Giffnock SC Girls section! We have around 10 volunteer coaches who manage the games and training. In summer 2017, we welcomed Nicola Hardie to the club. Nicola is the Rangers Ladies Goalkeeeping Coach – Nicola is also involved in the Scottish u15 Girls squad. Nicola will be helping manage and operate the girls section. 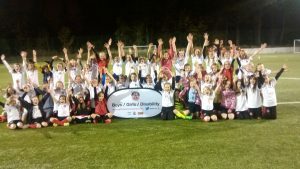 From P3 onwards our girls have the opportunity to train and play in girls teams. Our U9s squad can train in the Jane Ross session (see above) or on a Monday night at Eastwood Park from 6pm – 7.20pm. (During the winter they train at Mearns Castle High School from 7pm until 8pm). The girls also have the opportunity to play fun, organised games every Sunday morning. Our U11s squad train on a Monday night at Eastwood Park from 6pm – 7.20pm. The girls also have the opportunity to play games on a Sunday morning. Our U13s train on a Monday night, 6pm – 7.20pm and Wednesday night, 7.20pm – 8.40pm. Both sessions are at Eastwood Park. We also have one u13 team who participate in the West Region league and cups. To register interest, email Nicola on footballdev@giffnocksoccercentre.com .Training will begin Sept/Oct 2019. 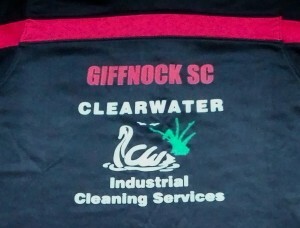 We are pleased to announce that Clearwater have kindly sponsored tracksuits for the u13 girls team. My daughter has just left pollock as they folded, l am looking to maybe bring her to yourself, would you be interested? She is 15 plays centre back but can play other positions to and is a left footer.